Combining cutting-edge style with unparalleled battery power, Sony today announces the latest addition to its popular family of Sony WALKMAN MP3 players. With quick-charge functionality giving three hours of battery life in just three minutes(1), the new Sony WALKMAN models offer one of the fastest battery recharges on the market. The Sony WALKMAN range also boasts an unrivalled playback facility, with 28(1) hours playback when using the ATRAC3 format and 27(1) hours with MP3, using the internal Lithium-ion rechargeable battery. The new Sony WALKMAN range offers high-speed transfer capability via the direct USB plug, and thanks to Sony ATRAC compression technology, the player offers maximum storage of up to 90 CDs for the 2GB model, 45 CDs for the 1GB and 22 CDs for the 512MB at 48kbps. With the 1GB and 512MB players, an FM Tuner is also optionally available giving users a wide variety of listening options. The WALKMAN launches with a new range of stylish accessories including neck strap headphones, protective case, and an armband case for listeners on-the-go; all available from the end of this month across Europe. The WALKMAN will be available from the end of April 2006 across Europe. (1)During continuous playback in ATRAC at 132Kbps, super power save mode when equaliser is not in use. 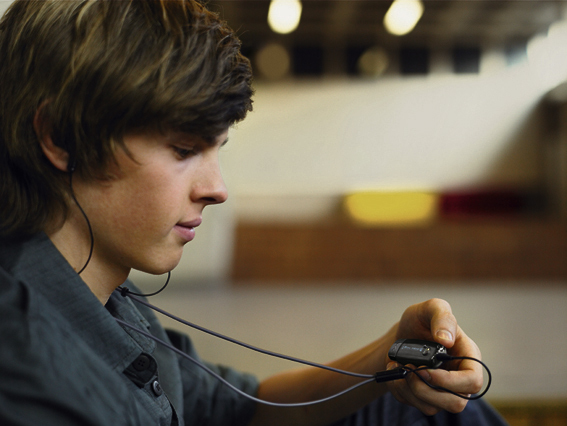 Sony is ready to introduce a new series of WALKMAN MP3 players beginning in April 2006.